(Nanowerk Spotlight) Clean and affordable energy generation and storage is one of the most significant challenges that our world is facing in the 21st century. 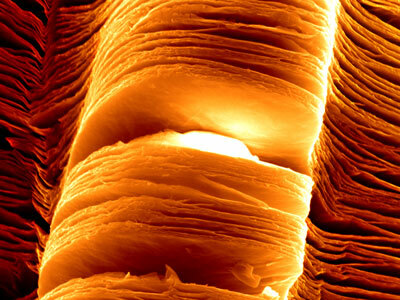 Materials are going to play a crucial role in generation and storage of renewable energy. While searching for new materials for electrical energy storage, materials scientists have discovered a new family of two-dimensional compounds proposed to have unique properties that may lead to ground-breaking advances in energy storage technology. "Our research team transformed three dimensional titanium-aluminum carbide – a typical representative of a large family of layered ternary carbides called MAX phases – into a two dimensional structure with greatly different properties," Yury Gogotsi, a professor in the Department of Materials Science and Engineering at Drexel University and Director of the A.J. Drexel Nanotechnology Institute, tells Nanowerk. "This work opens the door for a wide range of metal carbide and/or nitride compositions in form of 2-D sheets." Two-dimensional (2-D) structures, like graphene and molybdenum disulfide (MoS2), are known to have unique properties. Therefore, having a new family of 2-D structures with a wide range of chemistries can open the door for better understanding of differences between properties of 2-D and 3-D materials, lead to identification of useful properties of 2-D carbides, nitrides, oxycarbides and other related structures, and finally result in new applications. Reporting their work in the August 22, 2011 online edition of Advanced Materials ("Two-Dimensional Nanocrystals Produced by Exfoliation of Ti3AlC2"), a team led by Gogotsi and Michel Barsoum, A. W. Grosvenor Professor of Materials Science and Engineering, recounts their ability to transform 3-D titanium-aluminum carbide, a typical representative of a family of layered ternary carbides called MAX phases, into a two dimensional structure with greatly different properties. MAX phases, known as ductile and machineable ceramics, have been researched by Barsoum's lab for more than a decade and dozens of layered carbides, nitrides and carbonitrides with a variety of properties have been synthesized. As he explains on his website, "as a consequence of their layered structure, these materials kink and delaminate during deformation and also exhibit an unusual, and sometimes unique, combination of properties; they are not sure whether they want to be metals or ceramics. While they conduct heat and electricity like metals, they are elastically stiff, strong, brittle, and heat-tolerant like ceramics. They are resistant to chemical attack, readily machinable, and thermal shock, damage tolerant, and sometimes fatigue, creep, and oxidation resistant." However, these ceramics have always been produced as 3-dimensional materials, until Drexel PhD student Michael Naguib placed titanium-aluminum carbide (Ti3AlC2) powders in hydrofluoric acid at room temperature to selectively remove the aluminum. The result of this chemical process – referred to as exfoliation – essentially spreads out the layered carbide material and yields 2-D Ti3C2 nanosheets, which have since been coined MXene, as a kin to graphene. "To the best of our knowledge, metal carbides and/or nitrides have never been exfoliated" says Gogotsi. "This is the first time for a metal carbide to be produced in 2-D sheets. We believe that this is a major breakthrough in materials science. Discovery of a new family of materials has always been an important event. If MXene attracts interest of ceramic scientists, chemists, physicists, and computational material scientists, we may expect new exciting discoveries in the near future." Most notable is that the exfoliated material shows many features of graphene. For example, it can roll into nanotube-like scrolls, some with diameters of less than 40 nanometers, having the potential for a broad range of applications, ranging from energy storage devices to biomedical applications and composites. For instance, MXene could be used in energy storage devices such as electrodes of Li-ion batteries, pseudo capacitors, etc. The researchers also envision its use as reinforcement in composites, similar to clays or graphene, which increase mechanical properties and decrease gas permeability of polymers. A variety of surface chemistries, presence of transition metal oxides and high surface area make MXene potentially attractive for catalytic applications. Gogotsi points out that the implications and importance of this work extend far beyond the results shown in this paper. "We are talking about a large family of 2-D metal carbides and nitrides, so exploring different structures to find the optimum chemistry for each application is the next step in our work," he says. "Our students have exfoliated several other MAX phases and are working on their property characterization. The challenge now is controlling the surface chemistry of those 2-D sheets; because we found that changing the surface chemistry will change the electrical properties of MXene."